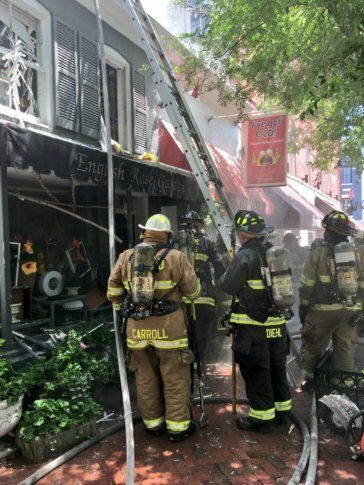 An accidental fire that started in a restaurant's kitchen damaged two businesses in Georgetown on Tuesday, D.C. Fire and EMS said. WASHINGTON — An accidental fire that started in a restaurant’s kitchen damaged two businesses in Georgetown on Tuesday, D.C. Fire and EMS said. American eatery Wingo’s and English Rose Garden, a florist shop, are the businesses that were damaged in the 3200 block of O Street Northwest. Firefighters responded to the flames just after 11 a.m., fire officials said on Twitter. The fire category was raised to a two-alarm fire shortly after. Flames were in the walls and ceiling of the building, D.C. Fire and EMS said. Two firefighters were hospitalized with injuries that were not life-threatening. D.C. Fire and EMS said the fire was under control around 1:30 p.m. Firefighters on the scene were in the process of cooling down and re-hydrating after their work. Most of the fire had been extinguished after noon, D.C. Fire and EMS said, and firefighters are continuing to put out the remaining pockets of fire. Below is a map of where the fire occurred.